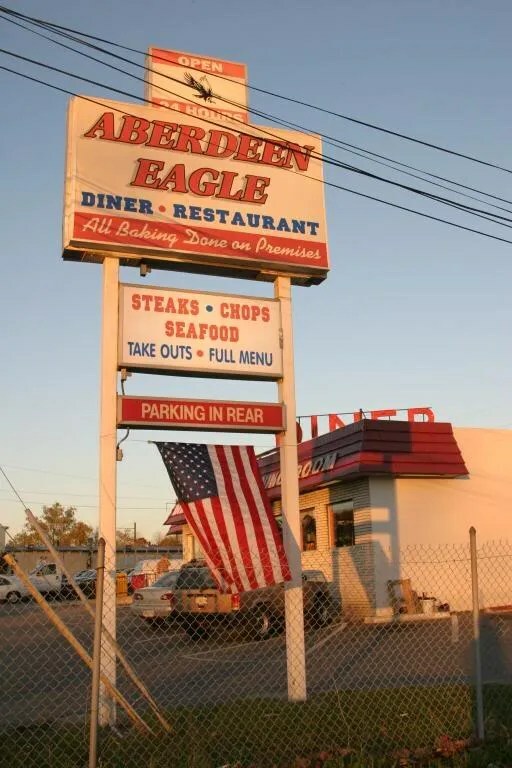 Exterior of the Aberdeen eagle. The corner stainless and the curved window are still visible, but that’s about it. 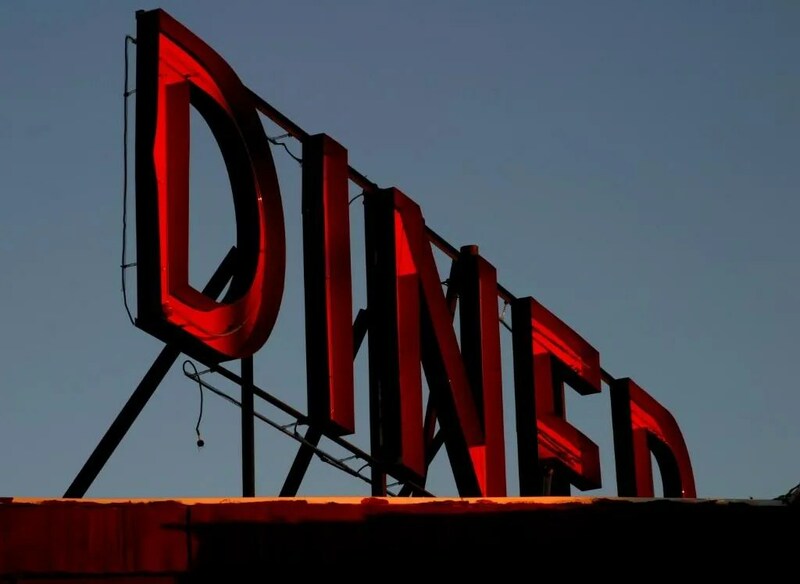 Brick and a red mansard roof disguise the true nature of the diner. Aberdeen Eagle- All baking done on premises. The sign states that they’re open 24 hours, something becoming rarer all the time. The rooftop neon. Presumably original to the diner, and not added at the time of the remodel. The interior. Very boxy- lots of hard corners, almost no curves, other than that of the counter and the scalloped edges by the menu-board. It’s leaning towards the more space-age and environmental designs yet to come, while still staying within the confines of a classic 1950s stainless model. Spindly stools with octagonal bases. Also interesting to note the use of an entirely tile floor. 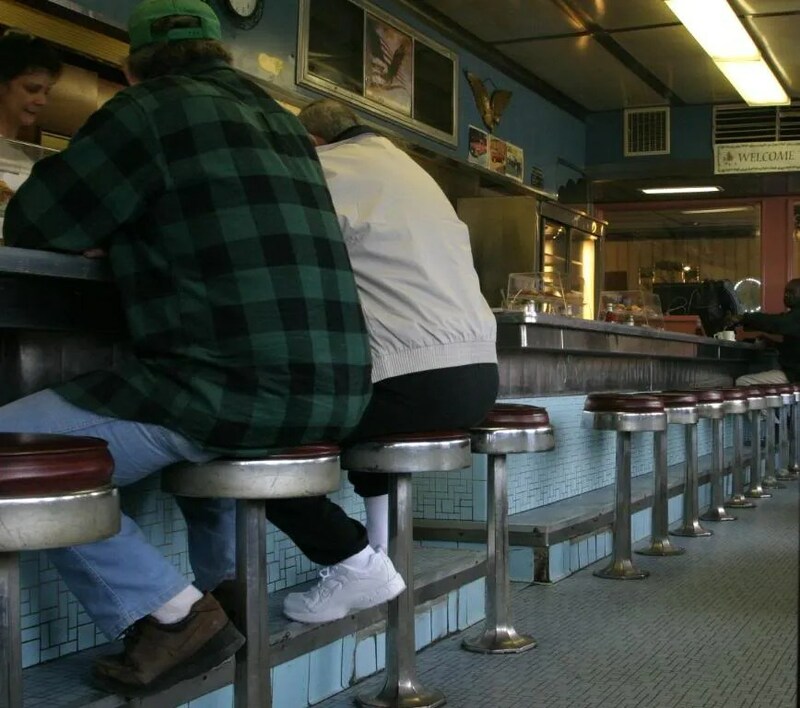 With the design of this diner, I would have expected terrazzo, and not older style mosaic tile. Blue is the overwhelming color. 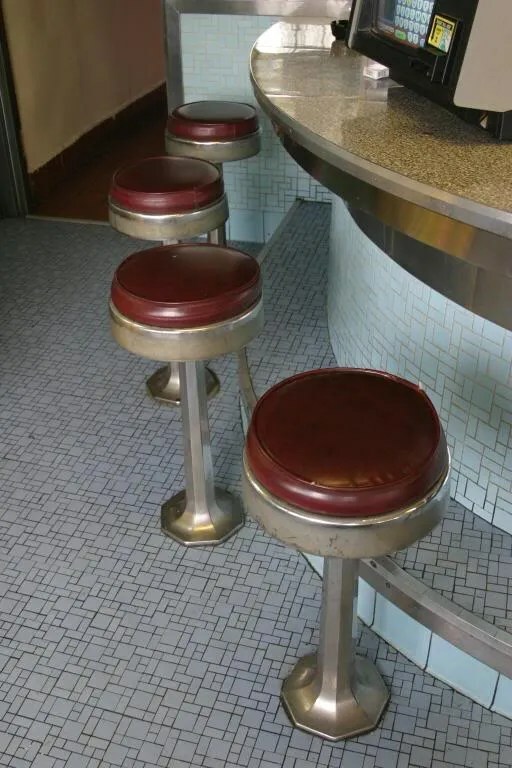 You don’t see too many of this model diner; not many with interiors with this kind of styling. What I have been able to find says it’s a mid ’50s Kullman. I’ve seen Kullman dinettes with similar boxy interiors, but this is the only full-sized diner I’ve been to quite like this. 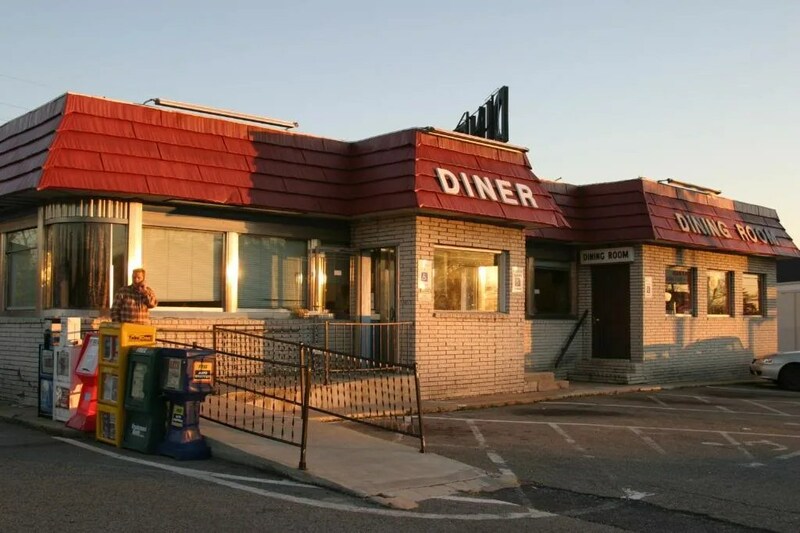 It has been covered over, years ago, with tan brick, with a dining room on the right, making it less recognizable from the road, especially when compared with the New Ideal Diner, just half a mile down the road and across the street. Inside it is essentially in-tact. 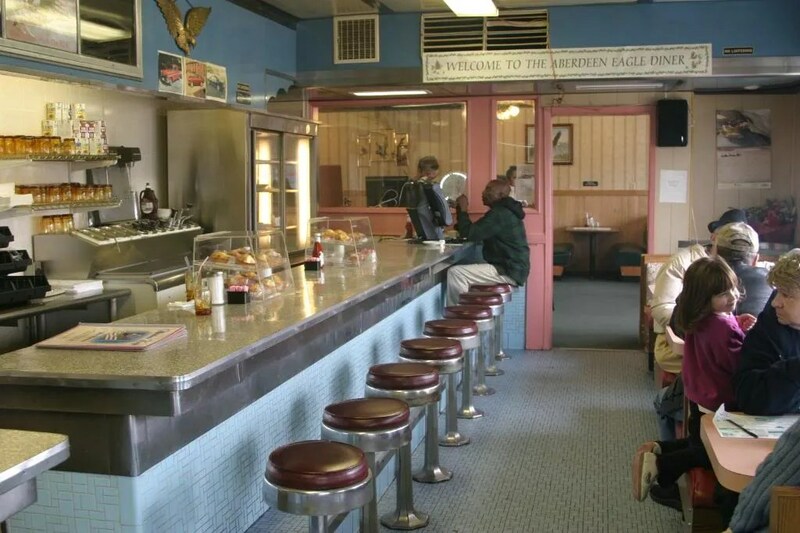 This entry was posted in Diners / roadside related, Diners/ restaurants, Kullman, Roadside attraction and tagged 1950s, Aberdeen, Aberdeen Maryland, Aberdeen MD, American, americana, baby blue, baking, blue, chops, classic, dining room, Eagle, formica, Kullman, kullman dining cars, late '50s, Maryland, MD, mid '50s, newspaper boxes, Open 24 hours, restaurant, seafood, space age, stainless, stainless steel, Steaks, sunrise, tile, Vintage by Spencer Stewart. Bookmark the permalink. We were there the first of August discussing the shooting years ago. We would like to get on your facebook page. We took pictures there last week, we would like to post them on your page.